JOHANNESBURG, (CAJ News) – A COMBINED turnover of R890 million by small and medium size enterprises (SMEs) under the Shanduka Black Umbrellas progamme has highlighted the programme’s success and illustrated the key role businesses of this size can play in the country’s economic growth, if given enough support. This revenue has been generated by 934 SMEs have been incubated since conceptualisation of the programme, which offer wholly emerging black owned businesses support and infrastructure through a tiered business incubation model. In 2009, the Shanduka Foundation (now the Cyril Ramaphosa Foundation) partnered with SBU to escalate the project countrywide with R5,2 million invested in the set up and operations of a Gauteng office. 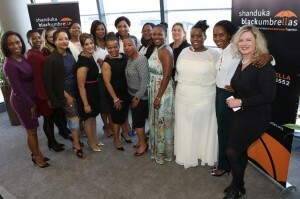 It is against this background, that celebrating women and establishing meaningful networks in the framework of entrepreneurship and corporate South Africa was the theme at the recently- ended SBU Women’s Month celebration, which was hosted by the national enterprise and supplier development organisation. Some of the women who attended are economic strategist Thabi Leoka, who was the keynote Speaker who joined SBU Chief Financial Officer, Nyasha Dzumbunu, in remembering the significant contribution made by women in the 60-year anniversary of Women’s Day. “The march that was in protest against the proposed pass laws in 1956 was led by iconic women in a display of courage, leadership and unity and today serve as an inspiration and a reminder of the role women have played in shaping South Africa to be the country it is today,” said Dzumbunu. She noted there had been many female trailblazers that had pioneered the development of women. “Since that time and today, we celebrate our roles in not only a professional capacity but also as mothers, wives, daughters and sisters as well as key role models in our communities,” added Dzumbunu. SBU Chief Executive Officer, Seapei Mafoyane, restated the organisation’s ethos in unearthing black female entrepreneurs, which comprises of reaching out to the most remote locations to inspire small and medium-sized business development. This, for Seapei, represents the next economic frontier and speaks to SBU’s commitment which has culminated in a total of 934 SMEs that have been incubated since inception of the programme. Mafoyane said the role of women needed to be more prominent outside the numerous facts and statistics that exist. “Women know how to get things done and therefore it makes me proud to know that 60 percent of our staff is women and it remains imperative to keep this impetus of positioning women at the forefront of leadership roles,” emphasized Seapei. Seapei engaged her guests on issues pertaining to the impact women make in business noting the effects of the influence of women such as the palpable evidence of successful women-led companies in the context of decision-making and positive return on investment. “SBU steadfastly continues to play an active role in changing the stereotypes and prejudices fashioned on women particularly within the spectrum of entrepreneurship,” says Seapei .